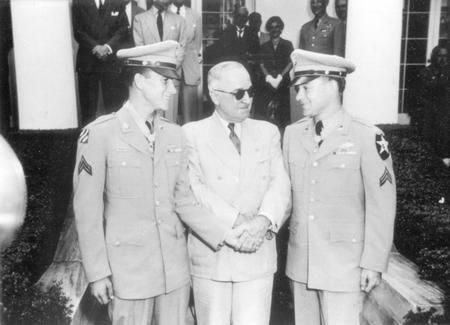 Reproduction of photograph depicting Ron Rosser with President Harry Truman and another soldier at the ceremony where Truman presented Rosser with the Congressional Medal of Honor, 1952. Rosser was a corporal with the Heavy Mortar Unit, 38th Infantry Regiment, 2nd Infantry Division, United States Army. During service in the Korean War he received the Congressional Medal of Honor for his single handed attack on enemy bunkers. Harry S. Truman was born on May 8, 1884, in Lamar, Missouri. He spent most of his youth in Independence, Missouri, where he attended the local public schools. Upon graduating from high school, Truman went to work to help support his parents and his siblings. He held numerous positions, including railroad timekeeper, mail clerk, bookkeeper, and bank clerk. From 1906 to 1917, he worked as a farmer near Grandview, Missouri. With World War I’s outbreak, Truman enlisted in the United States Army, rising to the rank of major and commander of an artillery battery. Upon the war’s conclusion, Truman returned to Missouri, where he married and opened a men's clothing store in Kansas City. In 1922, Truman closed the store due to a lack of business. It was not until 1923 when Truman decided to make politics his career, although he had previously served as the road overseer of Jackson County, Missouri, and the postmaster of Grandview, Missouri. In 1923, he became a county judge in Jackson County, Missouri, an office he held until 1924. In 1927, he won election again as a county judge in Jackson County, remaining in this position for the next seven years. Interestingly, Truman did not preside over any judicial cases during his time as a judge. County judges in Missouri during this time primarily oversaw the maintenance and construction of roads and other public structures. In 1934, Truman, a member of the Democratic Party, won election as one of Missouri’s two United States senators. As a senator, Truman worked closely with President Franklin Delano Roosevelt. With the Great Depression gripping the United States, Roosevelt sought to implement his New Deal program, and Truman helped to force the president’s agenda through Congress. Because of Truman’s loyalty, Roosevelt selected Truman as his vice-presidential running mate in the election of 1944. Roosevelt and Truman won the election, making Truman Vice President of the United States in 1945. Truman remained vice president for just eighty-two days. On April 12, 1945, President Roosevelt died, making Truman president. As president, Truman saw the surrender of Germany and authorized the use of two atomic bombs on Japan, resulting in the end of World War II. He also faced increasing opposition from the Republican Party, which generally hoped to restrict workers’ rights and hinder labor unions. Truman also saw the outbreak of the Cold War, and he stringently opposed the expansion of communism through both economic and military means. Despite these difficulties, Truman won election in 1948, although at least one newspaper declared that Truman’s opponent had actually won. Illustrating how divided Ohioans were politically, Truman carried Ohio by just 7,107 votes over his Republican opponent in the election. Tensions between the United States and the Soviet Union dominated Truman’s second term in office. At Truman’s urging, the United States helped establish and joined the North Atlantic Treaty Organization. Truman also committed United States troops to the Korean War, hoping to stop the spread of communism into South Korea. Within the United States, the Second Red Scare erupted, with political leaders, like Senator Joseph McCarthy, and common people in the U.S. actively seeking out communist supporters. In Ohio, state leaders also participated in these efforts to find communists, forming agencies like the Ohio Un-American Activities Committee. In 1952, Truman chose to not run for reelection, although he did claim on several occasions that he would run for president again when he was ninety years old. Truman returned to Independence, Missouri, where he retired from politics. He died on December 26, 1972, two years shy of his ninetieth birthday.